ThermoFab expands business sectors to include commercial off the shelf products for the armed services. ThermoFab creates an ask the expert page on the website. Ahura Scientific, Avedro and Transparent Technologies released new projects this month. A new business win with Ahura Scientific will produce a specialized tray used in airport screening. Avedro has called on ThermoFab again to produce a new medical cart enclosure. Transparent Technologies will produce additional server bezels for a specialized branded product. ThermoFab asked for input in PlasticsToday/MPW on a thermoforming article for the PlasticsToday Global Plastics Sourcebook. The article is expected to release in July. Stay tuned! April: ThermoFab Embraces Fun Marketing Concept. PerkinElmer, a Massachusetts based company dedicated to improving human and environmental health through science, innovation and application, chose ThermoFab as their thermoforming of choice to bring a new product to market. Insight Technology, a leader in laser aiming and night vision equipment for the U.S. Military and Federal Law Enforcement Agencies, chose ThermoFab to improve the design and functionality of one of their night vision solutions. Corindus, a provider of intuitive robotic technologies for catheterization laboratories and radiology/special procedure suites, partnered with ThermoFab and FarmDesign on their second generation robot application. March: ThermoFab is a Winner! 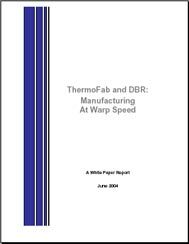 ThermoFab transformed its manufacturing process in 39 days. ThermoFab sees dramatic improvement in work-flow.